VARIOUS OPTIONS FOR YOU TO CHOOSE FROM! 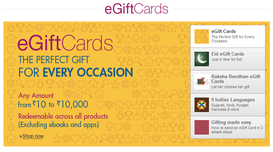 E- Gift Vouchers (E-Mail Vouchers or Egv) is instant voucher delivered at your Email. one can directly use it or you can gift it to your loved ones as a gift. Once you buy a gift card, say this one, the gift card is sent in an email to the person you asked them to deliver. It contains a code, which is different for every card, and is valid for one year from data of purchase(this one can be used to buy anything except Kindle eBooks & Apps). The email Vouchers is delivered instantly after completion of payment. One can now buy anything from amazon, and during payment they can apply the code to reduce the price by that amount. Amazon Gift Cards are the perfect way to give them exactly what they're hoping for - even if you don't know what it is. 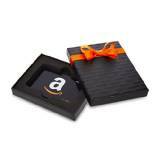 Amazon Gift Cards are redeemable on all products (over 2 crores) on amazon.in . Gift cards can also be in packs of 5, 10, 20 and 50. Explore multi-packs. Gift card comes inside a gift-ready gift box featuring a variety of designs for any occasion. Amazon Gift Cards are valid for 12 months from the date of purchase and carry no fees. Amazon Gift Cards are also a great way to motivate, reward, and appreciate your employees or customers. Order denominations of your choice, large quantities, and custom Gift Card. Gift card comes inside a gift-ready gift box featuring a variety of designs for any occasion. We make sure that what feels good, looks good as well! Choose your favorite Amazon greeting cards from thousands of available designs. Amazon greeting cards are 5" x 7" in size and are produced on digital offset printers using 110 lb. paper stock. Amazon Gift Cards are valid for 12 months from the date of purchase and carry no fees. Choose any denomination from Rs.1000 to Rs.50000. Choose from over multiple gift card designs covering multiple occasions and multiple Indian languages.